A few days ago I came across the app, Happier in the app store. The logo was bright, colourful and had the word Happier on it... how could I not download it? After using it for the past 2 days, I had to share it with you guys. Let's face it, not every day is a great one but Happier is here to help change that. It's a simple and beautiful way to collect and share happy moments with people you care about. It's be shown that focusing on the positive and sharing good things with people you care about makes you happier, healthier, and more productive. Studies show that people who write down a few positive things about their day report feeling happier, less anxious, and more optimistic. They also become more productive, sleep better, and have fewer physical problems. Research has also shown that happiness is contagious. If you have a friend who is positive, you're 15% more likely to be positive. (hear that friends? cheer up!) Being happier isn't simply more enjoyable. Positive thinking and increased optimism have been linked to significant health benefits. 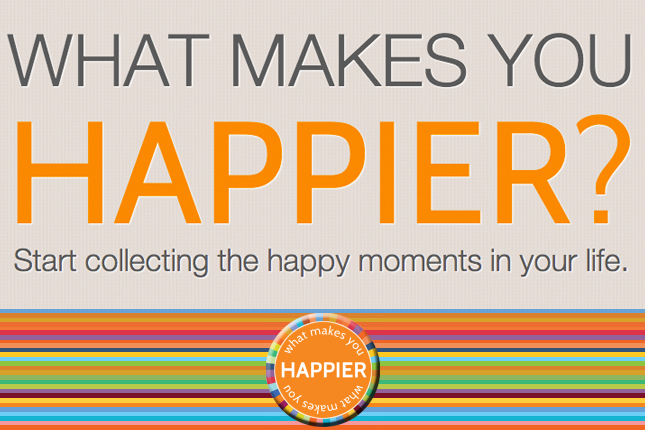 Happier people are more productive, sleep better, and make healthier lifestyle choices. Those who think more positively are 50% less likely to have a heart attack, catch a cold or the flu. More optimistic people make better dietary choices and are less likely to be depressed or have a stroke.